Jenny, a laughing Callum, sister Emily and Grant enjoying a rare sunny afternoon in West Farleigh on the eve of their moving to Igtham. 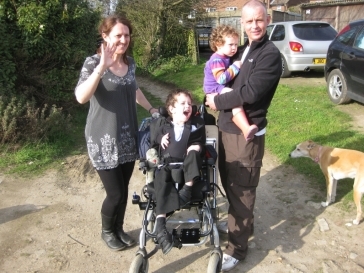 The family have lived in the village since 2005 and Jenny and Gary taught at the same school in New Feltham. They have prospered during their time here and made many friends, but with a growing family, they decided they needed more room and better facilities for Callum and a move was inevitable. The plan is to find somewhere nearer Callum's school in Westerham and they are renting a house in Igtham until something suitable turns up. We wish them every success and hope they will find a new home to suit their needs.